But feedback is only effective when you are able to get it right. In other words, feedback is helpful when you manage to get it from the right person, in a timely manner and format. Building a successful voice of the customer (VoC) program requires patience and commitment. Knowing how to unlock and read the signs of user inputs is what sets apart a surviving from a thriving company. Having such an organized program in place will ensure that your team gets the right amount of feedback, but also the true benefits of those responses. It will lead your team to define the customer experience your customers want. Yes, turns out those customer insights are effective. If there is one thing that you must do, it would be defining what you actually want feedback on. We have all received and seen this rough sounding generic question “Don’t hesitate to give us your feedback”. Turns out no one replies. Because it doesn’t speak to anyone. It is not attractive nor helpful to anyone. Narrow down to your feedback strategy and focus your questions on that. Then, ask questions in a tone of voice your customers will relate to. Your questions should be simple to understand, no industry jargon or complicated terms. All-in-all, this will give you actionable and helpful feedback. The second thing you want to do is define what success means for your company. There are all types of customer satisfaction metrics and they serve different needs. There are no one size fits all. Yes, I know, it’s too bad. But have no fear, you can easily learn those metrics and pick up the best ones for your company. The CSAT measures the true satisfaction of your users. Although the CSAT has proven to be very effective in some cases, it can also be very misleading. The calculation of the CSAT score is done by dividing the number of responses above 4 (4 and 5) with the total number of responses. It has been demonstrated that using the two highest values on feedback surveys is the most accurate predictor of customer retention. 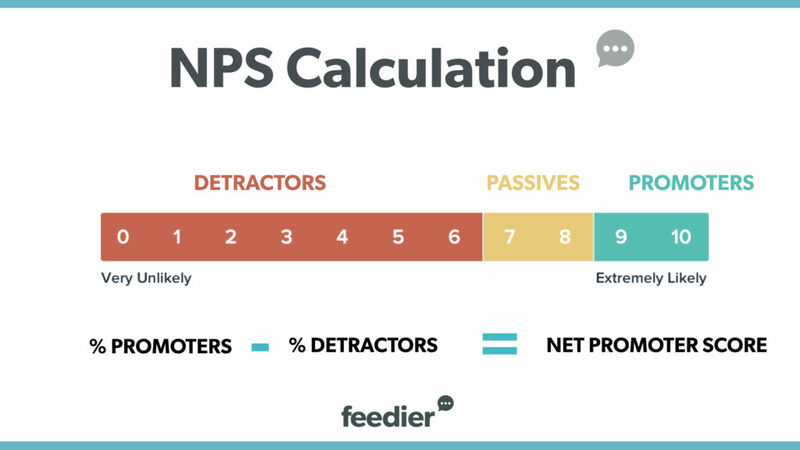 The Net Promoter Score, known as NPS, is a metric used to measures the satisfaction and loyalty of your customers. They are asked about their likeliness of recommending your product/company to a friend or colleague, on a scale of one to ten. Customers are then categorized, and the NPS score is worked out by taking off the number of detractors from the numbers of promoters. The NPS metric is very useful. But it can’t be used as a sole metric to measure your company’s growth. It is one of many indicators that should be reviewed. It is useful to identify trends over a significant period of time. NPS is a numerical question, and numerical scales are subjective and interpretive. Which make it very different from one company to another, and doesn’t make much sense to benchmark. This isn’t to say disregard NPS score from your customer success KPIs. But be mindful to add it to your basket of metrics. NPS gives you a quantitative idea of what is going on in your customers’ mind, but it doesn’t give you the WHY. It is therefore crucial to follow-up and get into the why with your customers. Why Does The NPS Work And Doesn’t For Others? It can be very effective for some companies. I don’t get why NPS asks to score from 1 to 10 when the score in interpreted on 1 to 3 scale. Why not directly ask a question with 3 choices? People on the internet score things very differently. If you check mobile app reviews, you can see that a review “The app was great, but the x feature was bad.” can be anything from 1-5 stars depending on the users’ mood. The scoring method is also controverted. 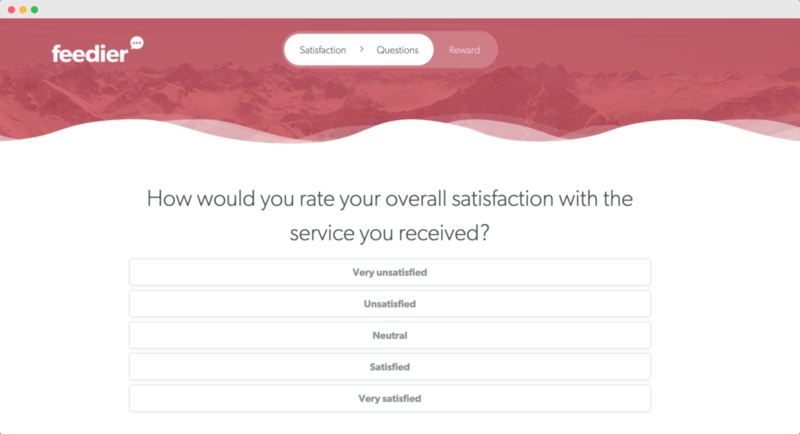 If you’re going for the NPS, you can either use generic customer feedback tools such as Feedier, or NPS-only tools such as Satismeter. The last metric we are going to cover is the Customer Effort Score, usually referred to as CES. The CES measures the easiness of using your product and service. How much effort do your customers have to do in order to get the true benefits of your offer? Do they have a hard time performing the different actions? The 3 metrics presented above can be use to measure an overall satisfaction, as well as the satisfaction in specific area of your business, product or offer. You could imagine doing a CES only on the pricing, in order to make sure that your pricing plans resonate with your prospects. Churn rate and customer loyalty: how long are your customers staying with you? Once you have identified your metrics of success, it’s important to identify the right channel(s) to collect those feedback. There are different questions you can ask yourselves. Where Are Your Customers Staying? The first thing to figure out is where your customers are staying. You don’t want to send them feedback request through email if none of your customers read their email. Similarly, if you own a Facebook Group with your users, and you managed to foster a community of engaged users, you would want to get their feedback through the Facebook Group. It would save them an email in their Inbox, they would be thankful for that, but it would also feed your group with more engagement. If your are requesting SaaS feedback, ie. your customers are actual users of your application, consider using in-app widget to request relevant feedback. Which Channel Can You Leverage Without Coming Off as Spammy? The same way you want to be relevant to your customers, you also want to make sure that they will engage your message. Which is why following-up is key. Sending too many messages is not ideal, neither. Make sure to have a cohesive approach across the organization, and inform all your colleagues about the requests, you don’t want to sound redundant. Improving feedback quality is an important issue that also needs to be addressed, but in terms of feedback quantity it may seem trite to say it, but the best way – indeed the only way – to increase the amount of feedback you are receiving is to ask for more of it. And the best way to maximize the amount of feedback you are receiving is to build the request for feedback directly into your systems and processes so that it always occurs automatically at every appropriate occasion. Quotes Rick Adams (Twitter|LinkedIn) in his upcoming book “Practical Customer Success Management: A best practice guide for managers and professionals”. Let’s get into the different channels you can use to get feedback from your customers. The first channel, and the most obvious one is email. Email works great when you are in regular contact through the channel and they expect to see your messages. 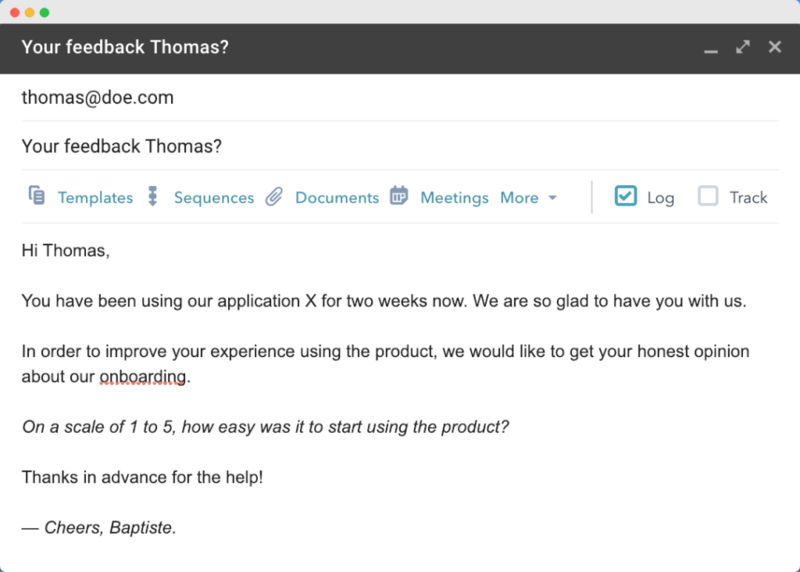 You can ask your customer feedback question directly in the email. Make sure to A/B test email copy and subject line. 33% of email recipients open emails based on the subject line alone. If you are going to use feedback survey, the first thing you want to do is identify the right customer feedback tool for your use-case. Using surveys would allow you to get more structured and organized feedback, all in one place. You could also reap the benefits of integrations with other tools such as your Customer Relationship Management software. As you have seen, surveying your customers can be done through different channels. One of the most effective in one-site. For instance, if you want to obtain direct feedback from your customers ordering on your website, you could trigger a pop-up on the order confirmation page. Another example is the release of a new feature in your web application. You could wait for a special event to occur and request the feedback at this point. 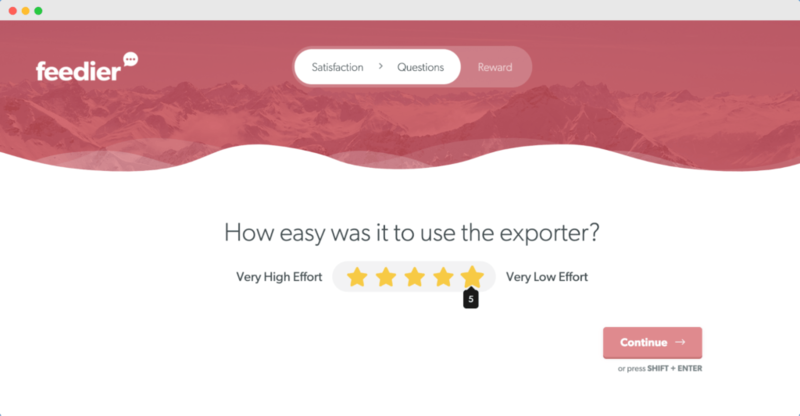 Tools such as Intercom allow you to get feedback through chat-messaging, and tools such as Feedier would allow you to embed your feedback form in the widget. This would be obviously automated. If you have a large user base, you should consider whether you need to ask for feedback to every single customer or not. One quick piece of feedback you can receive is immediately after a support ticket is closed. This would not only help you determine the effectiveness of your support team and their answers, but also the cadence at which your customers expect you to answer. Being active on social media and online communities is another way to get feedback, which is usually set aside. Crowdsourcing feedback on niche/industry and associated engaged and active forums works fantastically well and is frequently overlooked. 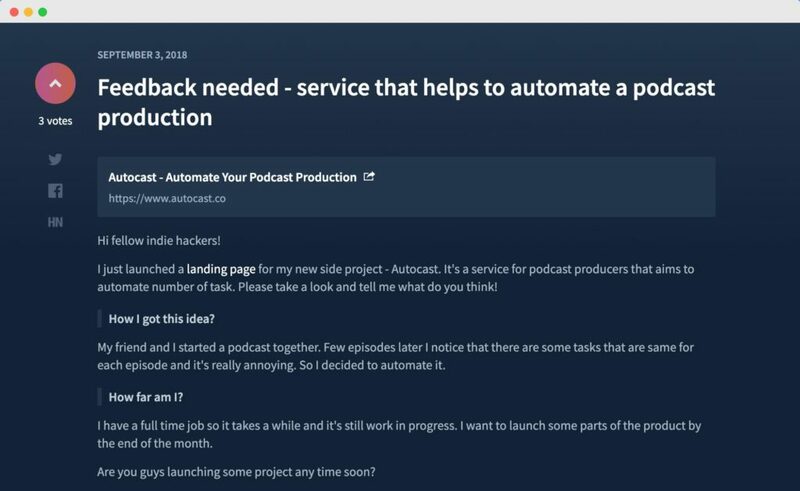 An example of this in action that I’ve recently discovered is Indie Hackers and Failory In this example, it’s mainly for entrepreneurs and developers but has wider marketing and business appeal also. You can not only seek feedback by engaging with communities, asking questions, and even dropping link to your actual feedback surveys. Consider adding value to the community before immediately pushing for feedback. You don’t want to come across as too selfish. Communities such as Reddit have special requirements and a minimum number of engagements needed before being able to post. It cuts through the spam. Besides leveraging communities, you can also build an engaged base of fans on social media. Not only you can actively seek feedback, but also you can listen and wait for the feedback from your customers to come in naturally. We will touch on this in section 5. 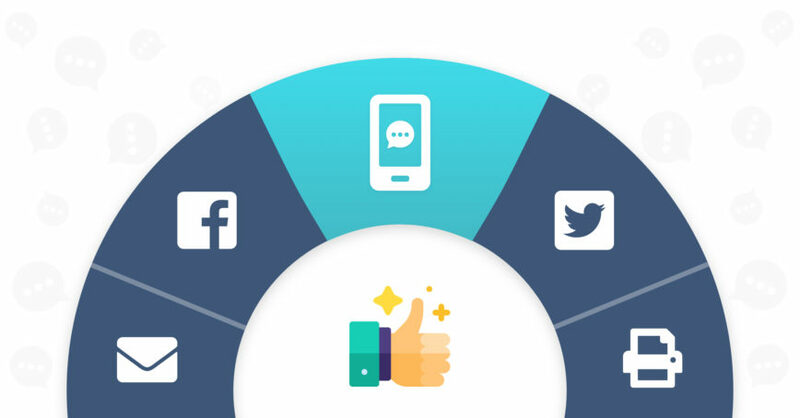 Building a feedback machine means that you provide a cohesive customer experience. Your feedback requests seem natural to your customers, and they are able to answer them smoothly. If you are not able to ask for the right feedback question, you will not get the expected feedback. The first thing you want to do is ask time-relevant feedback. The same way you would not want to receive a Christmas offer during Summer, your customers don’t want to receive irrelevant feedback request. For instance, in the case of customer service feedback, you would want to send your request right away, as soon as the support ticket is closed. Sending the request 3 days after the ticket has been closed would not make any sense, the customer has moved on by then. The same way you would not want to ask for feedback in the middle of the checkout process, you don’t want to interrupt your customer halfway through the flow. A great moment to ask for feedback is right after a customer service conversation. You are already in a conversation with the user so it feels natural to ask feedback – not about the specific customer service intervention but about their experience with your tool in general. I hate the feeling of my time being wasted. Don’t you? Always be respectful of your customers’ time when asking for feedback. You could even be even kinder with your customers and incentivize them for their feedback, and their time. This is usually referred to as survey incentives. This is a surefire technique to build relationships with your customers and show them how much you value their time. When challenged with collecting customer feedback, we’ve tried a number of methods to get the job done. One creative thing we have done is offered a giveaway contest for small gifts like $25 Amazon gift cards. We say that 5 respondents will win and send the survey to hundreds of customers. By offering a prize, we see a much higher survey participation rate. But it also depends on what you’re asking for. If this is for a simple feedback, an incentive would not be that helpful. Either way, ask straightforward questions, and strive to make the customer experience as cohesive and easy as possible. Karolis from Zest.is told us about a survey they ran before Christmas 18’ which turned out to get a 19% survey completion rate. We didn’t use any specific tactics, it was a straight & transparent ask for help to make their experience better. The key is the bond between our users and us. We connect with our users from when they join Zest, and because we get to know each other well, the survey is like a favor for a friend. The feedback we received was much more in-depth, honest and actionable than we could ever imagine. This is essential for any small startup as you have the means to communicate with your users and build an unbreakable tribe who will assist you in your journey. Besides actively seeking for feedback, you have to also listen and monitor the feedback that comes in. Your customers are talking about you and your competitors on social media, across other relevant channels. This is great! This is another opportunity to get feedback and improve your customer satisfaction. Which is why you want to be proactive, and answer every comment that comes your way! Tools such as Mention or Awario are great for social monitoring. You can also monitor on other websites, such as blogs, local listings, and so on. If your customers are not happy with the resolution to a negative experience, they are likely to voice their displeasure. Make sure to answer, understand their dissatisfaction. You might even be able to turn their disagreement into an opportunity. Another good tool is Google Alerts, which not only lets you monitor reviews, but also provides information on feedback about competitors. Collecting the right feedback is one thing. But you also want to exploit those customer inputs and reap their benefits. There is no rule of thumb for feedback analysis. What you can do is allocate part of your time for going through the feedback and informing the team about what your customers are saying. If the feedback tool you are using provide a reporting dashboard, that is even better. It will save you time and provide you better insights. This section was offered as a bonus by Nichole Elizabeth DeMeré, B2B SaaS Consultant, and it’s completely in-line with our mission at Feedier. There is SUCH a need to engage people in creative, fun, enjoyable ways – with every customer interaction. You can’t just shoot off a survey and expect people to answer unless there’s some kind of incentive to do so. There are just too many demands for our attention. The secret to collecting any feedback, from anyone, for any reason, is to make it a rewarding experience that engages customers while giving you the answers you need. Sure, you can do that with swag bribes, but you can also do that by making the feedback process fun in and of itself. Here are a few feedback methods to try. When your questions are relatively easy, you can get a lot of engagement by posting them in a poll on Facebook. The key to making it fun is in the phrasing. Be funny, be informal, be human! 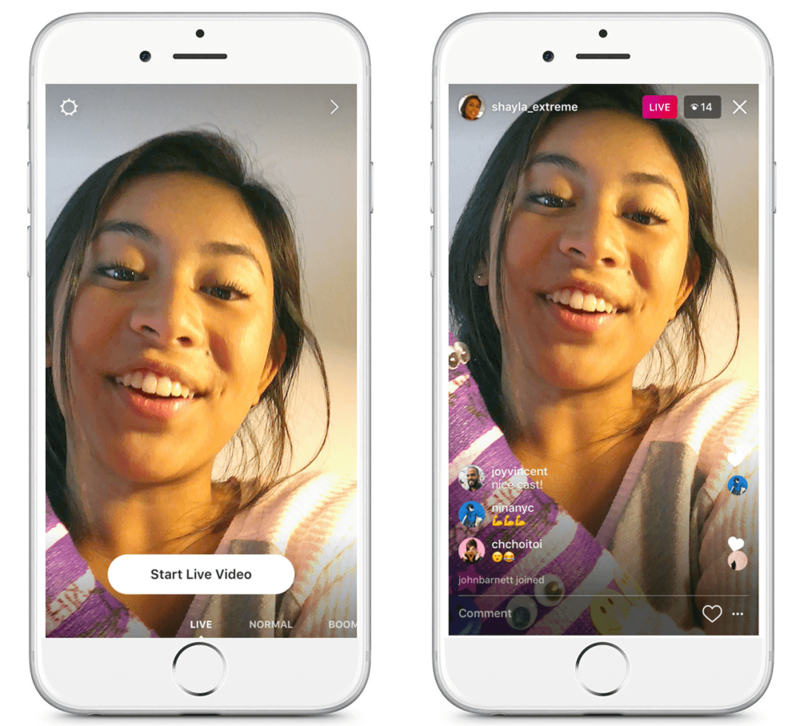 For open feedback, try hosting a Facebook Live video and asking for the feedback you need that way (be sure to write your questions in the comments too, for people who can’t turn the audio on). A live video from Zendesk popped up in my push notifications the other day, I clicked it to join and ended up having a really fun time chatting with them as they showed everyone their office and introduced us to team members. All in a live video. It was so fun and friendly. And, after the call, they asked for my address so they can send super cute brand swag to me. After that – they could ask me *any* question and I’d gladly answer because they engaged me first. As a B2B consultant, I’ve worked with a lot of SaaS startups doing customer research. One of the primary ways they get really good feedback is going to events and talking to people in person. Conversations happen naturally when you speak to people about what you do at events. If you’re a speaker, people will often come up to you with questions and feedback afterward. Ask current customers and prospects visiting your booth to take a survey or have an in-person interview. Offer a fun giveaway to people who meet your ideal customer criteria and answer your survey questions. Participate in event hashtags to invite attendees to your booth or speaking engagement. Design your booth to stand out in the crowd. Booths are like landing pages. You have to give people a reason to come, stay, and hang out a while. Think of it this way: What is the benefit to the customer of spending time at your booth? Make sure that benefit is clear and BIG enough to be seen across the floor! All-in-all, you will get the best feedback by iterating and testing different methods. There is no one-size fits all. Experiment and learn through your customers’ actions to see what is best for your company. But, take it from me, as long as you are proactive and learn from your acts, you will go a long way! Good feedback has the power to close the loop and build better relationships with your customers. Now, this is your show! In an upcoming article, I’ll cover customer feedback questions to stand out from the crowd and nail your customer feedback process. Subscribe below to get an update. In the meantime, what have been the best methods you have seen so far? Great tips, thanks for sharing. The Feedier team is doing an amazing job!